We were up early, as we were still adjusting to the new timezone, so watched the sunrise from Panzi's viewing platform. The vervet monkeys were stirring in the trees and eventually came down for morning play time. This was unfortunate for the local bushbuck who found himself being chased by 3 or 4 adolescent monkeys. Our day involved driving along the panoramic route. 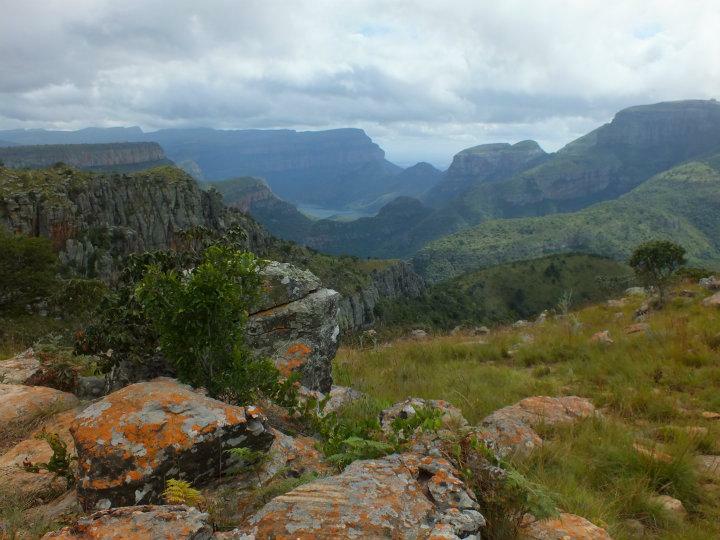 This takes you to the most picturesque points along Blyde River Canyon. Where we saw the Three Roondavals, the canyon and Bourkes Luck Potholes at the start of the canyon. Unfortunately by the time we reaced God's window, the most spectacular lookout - allegedly, the clouds had rolled in and we could see no more than 5m infront of ourselves. Instead we went back to the bottom of the mountain to see Berlin and Lisbon falls before heading to lunch in Graskop for their famous pancakes. After the delicious pancakes we went back to panzi for an afternoon bushwalk. We had to walk under and around what seemed like 1000 golden orb spiders and their webs. We did see some wildlife including warthog and wildebeest.